For starters: Yes I know I'm about to reinvent the wheel with the following task ahead. I want to create my own library for the ENC28J60 for an AVR (ATMEGA1284P). So I've been browsing the net for months now made fairly good progress, but now I'm hitting walls to often. 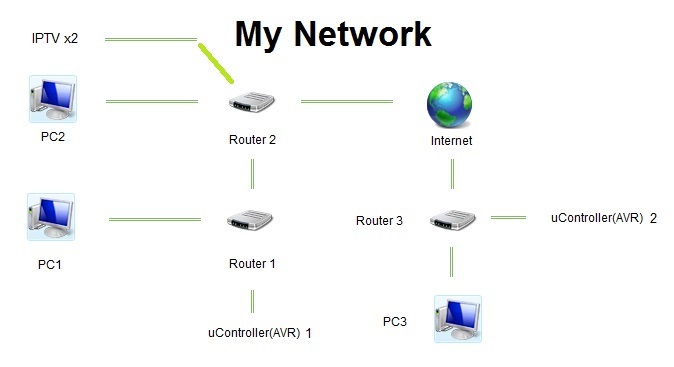 This is my network layout. For the first step I'm only atempting to communicate uC1 with PC1 over Router1. The final step would be to have communication between PC1 and uC2. Tobby Jaffey in his answer here has broken down the steps to how to get the chip to work. Now with the help of his list I'll show you all where I'm at right now. Now, I'm confident that my hardware works. Pull the rest of the application code (web server/etc.) into my project. Blinking a LED is no problem. I'm using logic XOR for it. Works for me. Communication over UART is only one way from uC to PC. I'm displaing data in HyperTerminal. For every new untested code fragment/part I'm sending a UART text line like to PC. After setting up the PHY registers and pluging the cable in, LEDs are blinking, but still no data is accepted. I've been also checking the packet counter. It's always 0. Interrupt is enabled only for packet receive. Never goes to logic LOW level. Hardware, as in the ENC28J60, is from shop, so it's not self built, connection errors are less likely. The ATMEGA1284P test panel is self made, connections tested. Could not get the ECON1.RXEN bit to set. Somehow it fixed it self, don't know what did. Not getting any data in the recive buffer. LED blinks on RX activity. Maybe dropping the CRC check in the filter will help? Yes! Dropping the CRC check helped. Now I'm able to receive packets. Browse other questions tagged microcontroller avr ethernet enc28j60 or ask your own question. When connecting to Ethernet through ENC28J60, why use ATmega88 instead of ATmega8? Poor eye diagram, where to start looking?